The famine between the years 2010 and 2012, which killed more than a quarter of a million people in the country, offered important lessons to the aid community. This spring, when poor rainfall led to large scale crop failure and a rise in malnutrition, the freshly elected government raised immediate alarm. A looming crisis stood to affect nearly 6.7 million people in the country, or more than half of the population. The new expansion of a cash-based strategy, largely owing to Somalia’s strong network of money vendors, ultimately formed the basis of a formal team, called the Cash Based Response Working Group 2017. This group, drawing from reports of 2011, formulated new means of distributing cash, quickly and efficiently. Jordi Casafont Torra, a humanitarian affairs officer with the OCHA, and who worked directly with teams on the ground to respond to the crisis, explained the distribution of money to all those affected. The new ways of sending out money were many. The most popular one, he told IPS, was the use of an electronic voucher called a SCOPE card. Funded by the World Food Programme, these cards could be easily used in all local stores that quickly became handy with the new form of payment. The cards, much like debit cards, were recharged with money, and could be swiped to check out items from local stores. Other vouchers, like “water vouchers” directly targeted specific supplies. Still other vouchers, like those that came with a cash-for-work incentive, put more people to work to build the local infrastructure, the lack of which often impeded work, in exchange for money. Slowly, Somalis began shaping the economy. Within a month since teams were first alerted to the worsening drought conditions, 1.4 million people clocked out of danger. By May, the numbers had climbed to 3 million. “Cash enables affected people to choose and buy from local shops, having the double impact of both assisting persons and supporting the local economy,” Torra said. The ramping up of cash-based operations had set the stage for a locally supported and a sustainable economy. Similarly, Somalis, a highly mobile savvy population, also increasingly took to mobile money. In a country where nearly 73 percent used mobile money, SIM cards loaded with money were distributed. In June, for instance, over a million people used mobile money to buy items. The average amount of money, adjusted to inflation rates or other circumstances, was calculated by a measure called the minimum expenditure basket (MEB). In the month of July, this money was billed to 89 dollars for every household. Ultimately, data from feedback mechanisms, for instance, a UK Government’s Department of International Development (DFID) funded call centre in Mogadishu, showed that 75 per cent of the money was used on food, and the rest was used to buy household items. Some even used the money to pay off small loans. Increasingly, it became clear that a new flow of international aid, cash, and not goods, worked to mitigate the risks of an immediate famine. 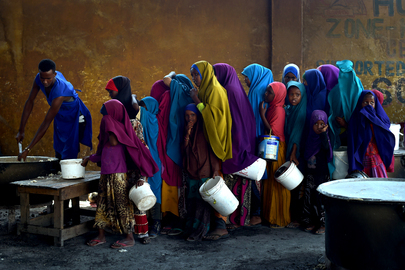 For now, in spite of acute risks in some parts of the country, Somalia has successfully averted a food crisis.